In the transport sector, motorcycling is one of the main segments. It should be a fun experience for those choosing to use it. Motorcycle users should observe their expected responsibilities and should put other road users into consideration. Also, they should ride following the law and they ought to follow some basic motorcycle safety tips. Amongst our many road users, motorcyclists are among the most vulnerable users. Motorcyclists should ensure that they can be seen by other road users by increasing their visibility. This can contribute to reducing the chances of the riders getting involved in an accident. If your fellow road users are able to see you, you are more likely to be avoided even in the case of bad weather or poor light. When choosing your gear, dress to be seen by wearing clothing that is colored brightly such as reflective strips or even a fluorescent vest. Riders should avoid bad weather whenever possible. Chances of accidents are increased by conditions such as rain because it not only reduces the grip of the tires on the road but also reduces the visibility of the rider. This will cause the rider to have difficulty in cornering. In the case of rain, the rider should be very gentle on steering and brakes to prevent sliding. A bike can unexpectedly slide due to moist leaves, sand or pebbles because there is minimal contact with the paved path as compared to a car. This can easily result in a spill. When a cyclist is on a bike, he might not notice potholes and bumps. This can be a serious threat when riding a bike. In case it is impossible to avoid them, make sure that before you encounter them, you slow down as much as you can with little or no steering input. To minimize chances of skidding, hazards such as railroad tracks should to be approached carefully to a right angle as much as possible to minimize chances of skidding. Comparing all the motorcycle safety tips, we feel this is the second most important. 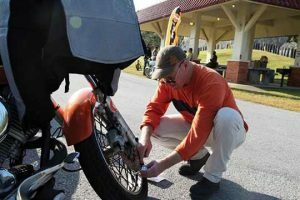 Before riding the rider should inspect the bike to make sure that everything is working correctly. Ensure that the signals of direction, horn, and lights are not faulty. Check that the tires are set to the correct pressure and inspect them for wear and tear. Inspect the brakes, shaft, and chain. Motorcycle mechanics that are interviewed, say they often see brakes that are worn out and wrongly inflated tires. They say this plays a role in safety risks. Anyone can be a safe rider by having a clear understanding of the road and acquiring the skills necessary. Most importantly one should understand that they are accountable for their road safety and should always be defensive and alert. If by chance something happens to your motorcyle and you need a tow, our tow company has all the necessary equipment to tow your motorcycle to a safe location.